Ben Train at "Magic Tonight"
5. David Merry in the The London Free Press - A very funny performer! 4. Clive Court, Life Member of the Canadian Public Relations Society - Congratulations Clive! 3. Spidey and his team The Surrealists on "Fake Off" - Cheer Spidey on! 2. Who's where June 2015 - Add yourself to next month's. The winners of the Allan Slaight awards were announced last Saturday. Special congratulations to Mahdi Gilbert for winning the Canadian Rising Star award! Congratulations to the first-ever Allan Slaight Award winners, recognizing outstanding achievement in the pursuit of the impossible! This contest is now closed. The winner has been announced! 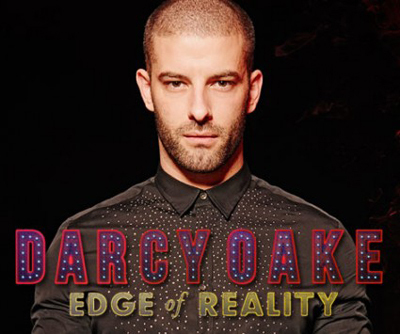 I am excited to announce that I have been offered one pair of tickets to give away to my readers, to attend Darcy Oake's show, "Edge of Reality" at the Sony Centre for the Performing Arts in Toronto, Canada on Saturday, November 14, 2015. I will be holding a random draw to determine the winner. (There will be one winner.) The seats are Orchestra Level (ground floor), Row L, valued at $55 per ticket. The draw results will be posted on Friday July the 17th. If you win, you must be willing to provide your full name and contact information for me so that the Sony Centre can arrange for ticket pick up. Contest closes on Thursday July the 16th, 2015 at 11:59pm EDT. Montreal, QC, Ring 62 (20th Century Ring) - Charter celebration party! The VanCity Buzz is having a contest to win two tickets to see Darcy Oake at the Queen Elizabeth Theatre on Friday, November 27. Our latest article in VANISH - International Magic Magazine contains some crazy stories from the road! Toronto: Save the date for the 2016 Browser's Bash! Canadian master illusionist and sleight of hand artist Darcy Oake, makes his highly anticipated return to Canada this November and December with his acclaimed Edge of Reality tour following UK dates that wrap up in London’s prestigious Hammersmith Apollo. The Canadian tour includes appearances in Toronto, Calgary, Vancouver, and takes the award-winning illusionist back to his hometown of Winnipeg, MB on December 4 at the MTS Centre. Darcy Oake has become a global sensation since his 2014 appearances on UK’s hugely successful television competition Britain’s Got Talent where he surpassed thousands of contestants to land among the show’s top ten finalists and win over 200 million viewers of the program worldwide. A YouTube clip showing Oake making doves seemingly appear out of nowhere, has garnered more than 52.5 million views alone. Watch the video HERE. Darcy Oake, like his contemporaries David Blaine and Criss Angel, brings a fresh approach to a mysterious and ancient craft. With the Edge of Reality tour, Oake delivers an exhilarating, logic-bending, and contemporary adaptation of an art form that has puzzled and entertained for centuries. Oake is the winner of multiple awards, including the coveted People’s Choice Gold Medal, which he received from the Pacific Coast Association of Magicians. Managed by Paquin Entertainment, he has since gone on to become an international magic champion and headlined at the iconic Magic Castle in Hollywood, made numerous international television appearances, including his own 1-hour Edge of Reality special on UK’s ITV, toured the globe and this Fall shares his passion for illusion in a new book Behind the Illusion, where he delves into secrets and history of classic illusions. Daryl comes to Toronto! With the help of Sorcerers Safari Magic Camp, the Browser's Den is proud to offer you the opportunity to spend an afternoon with the world's best Magician's Magician - Daryl. Even more so than usual, Daryl's sleek special lecture 4FXII (Four F Twelve) contains a wide variety of practical and PERFORMABLE magic for you. If you're into close-up, stage, magic that's impromptu, angle-proof moves, quickly resets, finishes clean, easy to perform, etc. - THIS LECTURE IS FOR YOU! Unlike other talks, The VAST MAJORITY of the magic performed & explained by Daryl in this lecture uses simple ordinary objects - with no need to buy anything! You may remember the May post with the commercial in question. Do you also remember that last year Wendy's did a magical ad campaign? In an attempt to get their new frozen chocolate drink noticed, the fast food company has decided to take part in a new marketing technique—a prank ad campaign. In short, Tim Hortons has implemented the act of levitation in attempt to get consumer’s attention. The franchise’s new chocolate drink—which has arrived just in time for summer—can be seen alongside Canadian magician Darcy Oake and two local actors. When the doors open to the shop on Sunday, July 26 there will be all sorts of tricks, books, magazines, props, nostalgic pieces out for your consideration...AT RIDICULOUSLY CRAZY LOW PRICES. This is not an auction. Rather, all the fantastic deals will be in boxes and tables throughout the shop. Many items priced less than $5.00. Plus 'Bags of Magic' loaded with stuff for less than $10.00 per bag. The items to be on sale are not from one source. Rather, they are from a bunch of smaller collections that we have received over the past few months. It was a card trick his dad showed him when he was eight years old that set Darcy Oake on his journey into the world of magic and illusion. Over here, we’d never heard of the Canadian until he appeared on last year’s Britain’s Got Talent but by that time he was already an international magic champion. At 16, he beat seasoned professionals at various events and ended up winning the coveted People’s Choice Gold Medal in Seattle. Magicana is pleased to present a new, interactive exhibition on the story of the cups and balls. It features the trick's history, timelines, video performances, commentary - and much more! Short and friendly reminder that this Saturday, June 6 at Browser's Den is our next (Free) Magic Club Meeting. All those interested are welcome; the meeting takes place from about 2:30pm until 5:30pm. Yours very truly-Jeff, Shawna, Lisa & Eric. Thank you to our June 2015 friends and sponsors! Thank you also to our sponsors for their generous support. 17 Le Lab Magique presents: Eric Girard, Krin Haglung, Gabriel Boileau et Fredo.